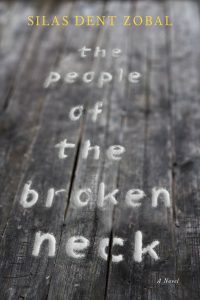 It’s hard not to think of beauty and language while immersing oneself in the pages of Silas Dent Zobal’s remarkable novel The People of the Broken Neck, but would one would call his writing Gassian or Gardnerian? On which side of this aesthetic debate would his work find the most sympathy? The novel floats like a “beautiful and powerful apparition” but draws unabashed attention to the dazzlement of its own surfaces—all while convincing us that we’ve reached altitude. To call Zobal a literary stylist might be missing the point. Yes, his sentences sing, gorgeously so, but they also feel carved out of the solid but supple substance of life, as when his brisk lyricism evokes place and duration: “Traffic moved through the street. Cars blared horns. The sidewalk was battered by winter boots. She took off her gloves and reached up and put her warm fingers against his cold cheeks.” Sometimes Zobal slips lovingly into a Hemingwayish mode (“The soft burble of the river was a nice sound. . . . They felt good. This was a nice place.”), but these moments always feel discovered rather than imposed. The moon shone bright over the Mississippi. Its light came in low and white and caught at the edges of things and the barren riverside trees cast thin leggy shadows that blurred with the shadows of benches or rounded bushes or boulders and formed a new shape behind them that looked to King like a great dark centipede. It would be more apt, then, to call Zobal a literary perceptionist—to coin a phrase—because style always emerges from perception, always serves meaning. Or rather, form is meaning. To sever them is to do violence to the integrity of the art. The musicality of his sentences—the lilt, the beat, the syllabic swing—is exactly the point. It don’t mean a thing, Duke Ellington reminds us, if it ain’t got that swing. The People of the Broken Neck does not indulge in pure (mere) formality, though. It is the thoroughly suspenseful, profluent story of former-Army Ranger Dominick Sawyer, a veteran of the wars in Iraq and Afghanistan, on the run across the country with his fifteen-year-old son Clarke and his ten-year-old daughter King. FBI agent Charlie Basin chases them as he investigates the disappearance of Dominick’s wife and the murder of a local sheriff’s deputy. Novels are always about consequences as they tumble forth from characters’ actions. The action here is initiated by Dominick, who “knew that certain mistakes were unpardonable, that certain errors would echo forever inside the four chambers of his life.” We read the novel in part to discover the mystery of the exact nature of these mistakes and errors. At the heart of the plot of The People of the Broken Neck is Dominick’s young daughter King, the object of her father’s and older brother’s protectiveness, their desire to save, to preserve, to spirit away from the dangers of the world. As the main source of narrative energy, she is also the character who most suggests the figure of the artist, who “wanted to explain what she could never explain,” who tries to dig into both the grand mysteries of the world and the small mysteries of her everyday existence, who wades into the (literal and metaphorical) river and touches “the icy undercurrent that ran like a secret life beneath the surface.” And it is her artful dissembling midway through the novel that alters the trajectory of the story. In the early pages of the novel, the narrative is also propelled forward by the strange appearance of “salt scrolled in alphabetic shapes” spelling out dark, mysterious words: “Wasp, read the words in salt. Neck, Broken.” These words in salt continue to materialize throughout in unexpected places, accruing significance as images connect, words sparking, energized by their unexplained relationships to one another. When Charlie Basin muses, “Did a secret ever hide anything that mattered? Weren’t important things always hidden in plain sight?” we suspect these salt words in plain sight are prophetic in some way we’re unable to interpret completely. As an investigator, Charlie Basin also wants to solve the mystery, not only of this particular case but also of his own life. His inner life is developed throughout the novel seamlessly, as are the overlapping questions, anxieties, and responsibilities of fatherhood that haunt both men. Upon hearing that Dominick has two kids, one boy and one girl, Charlie’s wife Rosamund says, “Just like us.” Later Charlie asks his son Oswell, “What if somebody had tried to take you away from me?” These are moments, to be sure, when readers begin to see these parallels rise to the narrative surface, but they are also moments when we are reminded that people tend to read their own lives into the stories of others, always on the lookout for similarities—one hopes as an act of empathy but at the risk of appropriation or complete erasure. In other words, other people’s lives can never be “just like us.” Even if we remain unaware of it, context calls the tune. We are told in a passage of omniscient narration, “The moments that tip the balance in our favor, or against, are always small enough to go unnoticed.” Charlie realizes the complexity of this truth, understanding that he “could have been this man . . . if just a few unidentifiable moments of his life had tipped against him.” As the novel proceeds, we, too, begin to appreciate more deeply the fragility of human identity as determined by experiences well outside of our control. Just as prominent as smell is imagery of wood and trees. The “sweet woodsy smell of sawdust” and “the crackle and spit of wood smoke” permeate these pages. Characters are described in woodlike terms: Dominick’s “face looked like a plank of wood”; his wife’s face is “like burled wood;” their children’s faces “fell like two halves of a split log”; King has “beech-twig arms”; and even a minor character’s eyes are like “kindled wood.” References to sapwood, bark, and various species of wood floors are only outnumbered by naming trees themselves: beeches, cherry trees, plum trees, dwarf apples, firs, oaks, white pines, hemlocks, ponderosa pines. The connection between people and trees resonates: “The pines in the mountains were as gnarled as ancient men.” Here the living trees are figured not only as people but as something ancient, something primary, elemental. Aside from this broadly human connection, there is also the very personal as Dominick “loved his kids as deeply as heartwood.” This observation and contemplation of wood and trees is peculiar and unmistakable at the level of plot, too, as a hollow tree and a woodpile are both key elements of the mystery as it unfolds. What to make of this preoccupation with wood? I read it as an artful affirmation of the real, the tangible and the true in an increasingly artificial world. Of course, art is artificial, too, wrought, a made object. This fact is foregrounded time and again in descriptions of the natural world: “Night fell over them like a tossed sheet. A giant orb of moon rose as though attached to a pulley.” It’s a paper moon, the song tells us, but it wouldn’t be make-believe if only we believe. Later, “The moon looked like it had been pared with a knife,” as though it were whittled from a piece of wood. Land shaped is landscape. They bought a map of Rockford at the gas station on the fringe of the strip mall. They found the trailer parked in the middle of a ring of willows beside the Kishwaukee River. No other homes were visible but they had driven past mailboxes planted at the edges of gravel driveways. A path of flat stones led from the road over a slight hill to the single-wide trailer. They walked around the building in a wide circle. The grass at their feet had begun to green. The outermost reaches of the willows’ branches were limned with furry buds shaped like arrowheads. The willows at the rear of their home gave way to a stretch of pines and cottonwoods that led to an island near their side of the river. They walked to the mud banks and looked around. The sun shone off the surface. The water ran clean and clear. Dark roots rose out of the ground and arched into the silt at the bottom of the river. There was a small sandy area, a boat launch, and an overturned green canoe. The water deepened quickly as it fell away from the bank and the stones at the bottom were rounded and the size of a child’s fist and colored white and red and brown and black. Read this passage and try not to be overwhelmed by the beauty of its subtlety. Silas Dent Zobal has written an exquisitely rare novel, at once a page-turning thriller and a meticulously crafted work of literary art.